ASPEN, Colo., Jan. 27, 2016 /-- The high profile, contemporary art gallery, Gallery 1949, has taken over Aspen along with the well known pop artist Nelson De La Nuez, whose art can be seen peering back at you through the gallery windows. International pop artist Nelson De La Nuez, branded by the media and press years ago as The King of Pop Art has connected strongly with the fashionable winter playground and wealthy summer arts colony. Modern Luxury Publishers prominent Aspen Magazine and its supplemental Gallery Guide for Winter 2016 saw the connection to its readers when they chose his artwork for its cover. 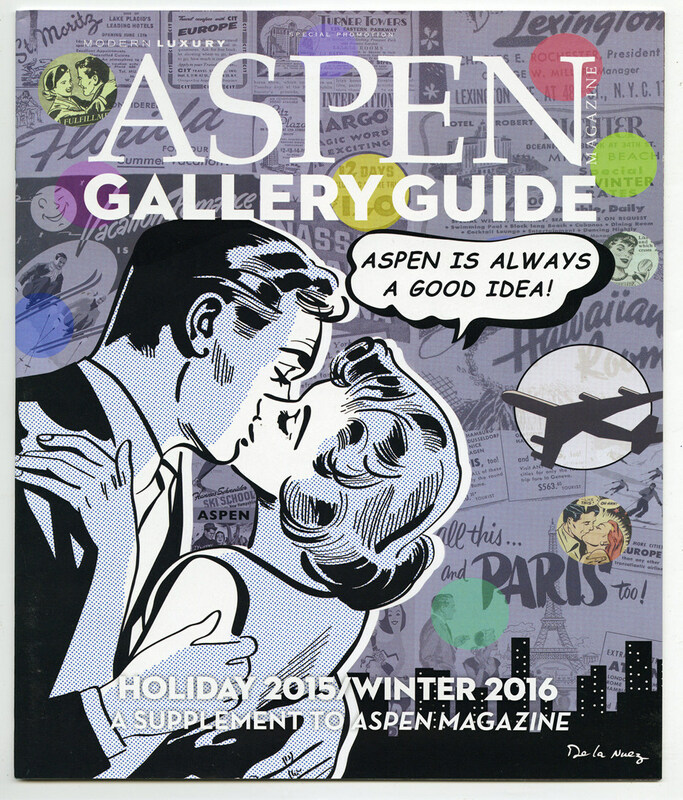 The jet setting couple kissing on the cover exclaim via a thought bubble "Aspen is Always a Good Idea!" Socialite and business mogul Paris Hilton, a regular skier in Aspen Instagrammed the actual large gallery painting while on vacation. The artist offers custom thought bubbles and unique one of a kind pieces at the Aspen gallery. Each one sells for approximately $30,000+ depending on size and availability. His one-off mixed media originals are difficult to come by and sell for a much higher price range, anywhere from $65k-105k. "A lot of the rare De La Nuez's original paintings end up being sold into private collections, so I am excited to be able to acquire his more rare work at Gallery 1949 and offer the art to the public first," exclaims gallery director Jared Goulet. "His art really resonates with my audience here, whether they are traveling, have a home here, or both. His themes are about the "good life"..travel, shopping, designer items women desire, wall street high finance and they are written in such an elegant, sophisticated way with a twist of fun," Goulet explains. The artist adds, "It takes time to create not only the painting but all of the writing the characters say. It's not just slapping a few words in a bubble. A lot of time goes into those words. It's an art in itself," De La Nuez states. Nelson De La Nuez, is struggling to paint at a fast enough pace to fill the orders of his galleries worldwide without compromising. When so many other artists achieve his level of success, they often never paint the actual art anymore, but rather studio assistants do. This has become the norm and he refuses to let that happen. The artist has been juxtaposing childhood games, Americana and luxury since the early 1980's. His style continues to evolve by constantly merging pop culture with relevant issues. Gallery 1949 also shows his artwork dealing with today's issues and something for everyone, such as, "Love Wins," a positive pop culture/Monopoly painting on the rights to gay marriage, displayed during Aspen Gay Ski Week, and "High Times," a satirical pot smoking children's book for the Colorado crowd and X Gamers. The gallery is located on Hunter St at the corner of Cooper, within a block of the luxurious Little Nell resort, not far from the prominent Caribou Club. The gallery director has an eye for what sells and seems to sell every De La Nuez that passes through his doors, including the limited edition, elegantly framed Pop Donuts sculpture that you would swear are real donuts with a frame that resembles white frosting. The Los Angeles artist will make an appearance for a solo show at the gallery later in the year and Goulet expects it to create quite a stir. De La Nuez is collected by thousands of celebrities, and entertainment industry executives, who happen to be the Who's Who of Aspen as well. About:Nelson De La Nuez's artwork is hanging in some of the most prominent, private collections of movie stars, directors, producers, comedians, corporations and art connoisseurs. His art has been featured on countless television and luxury interior design shows/celebrity homes. He's listed on the "Who's Who List of the Most Collected Artists of Our Time." De La Nuez's pop art is sold in galleries and auctions worldwide. He has new branded fashion lines debuting in 2016 in major department stores.